Get lost in a magical forest with the Linari Legno room diffuser. Close your eyes and sense the enchanting world hidden amongst the clouds. Fragrant breezes blow over gurgling creeks. Cedar and Sandalwood trees towering high with exotic orchid winding around its branches. The luxurious, rich aroma of worn out buttery leather adds a classy nuance.Heart notes of pineapple and jasmine lend its softness to the accord. Sensual musk closes the sorcery of the notes with its alluring smell. From the time you open the flacon, you feel like you are in the midst of a secret forest. Linari Legno Room Diffuser has a fragrancethat is sumptuousand imaginative. Inspired by wood and leather, the bouquet has a striking modernity with a distinct nod to the past. Warm,sweet andspicy,this sophisticated fragrance will envelop your surroundings in its allure. The attractive design of the bottle matches the scent. Linari Legno comes in a precious ruby flacon of Italian glass with a valuable wenge wood lid. Its stylish look will add a touch of flair to any decor. 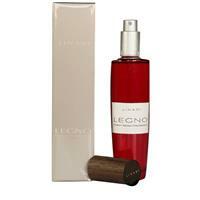 The Linari Legno room diffuser is a 500 ml bottle and lasts for a long six months.